Our 6 year old son DeAndre aka Optimus Dre wore this costume. Dre sustained a traumatic brain injury when he was two yrs old. From that point he became wheelchair bound with many ongoing issues. We decided to turn the negative into a positive and transform his wheelchair into a part of his costume. We have done this for him the past few years. 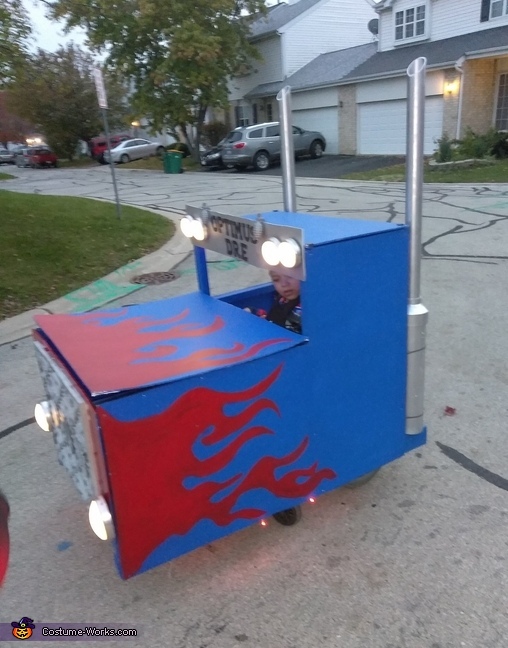 We used 2x4 for the frame, foam poster board for walls, paint from home depot, staples, velcro, a filter for his grill, PVC piping for his pipes, metallic spray paint, we ran red lights under the truck and blue lights for the interior, we also used push lights as headlights. We also attached a fog machine that was powered up with a lawn mower battery.